The 15-year gilt yields increased by 8 basis points and could have ended the month higher were it not for the US fiscal cliff crisis. After staring the month at 2.23% the yields decreased to 2.31% and was never below 2.23%. The other factor was the US fiscal cliff where President Obama and Republican House of Representatives had been negotiating to avoid the implementation of $600 billion of spending cuts and tax rises from january 2013. During the month markets were optimistic that a deal could be reached and this boosted investor confidence for the future with funds moving from safe havens such as US Treasury Notes and UK government gilts to higher risk investments. 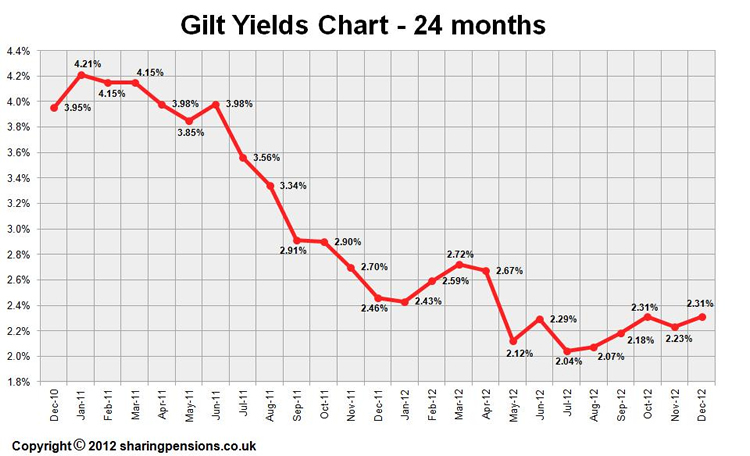 Gilt yields increased to a high of 2.45% on the 19 December and subsequently reduced to 2.31% as the negotiations were deadlocked at the end of December. Annuity rates were driven by the EU Gender Directive during the month with male rates reducing by an average of 2.77% and female rates increasing by 3.95%. For the latest updates see Annuity Rates Review. After the gender neutral pricing has been applied with the new Unisex rates, the data suggests standard annuity rates may increase by 0.48% in the short term and smoker annuities may increase by 0.99% although the new EU Gender Directive is likely to force annuities lower by 21 December 2012.